Tickets can be purchased at the Little Caesars Arena XFINITY box office and Ticketmaster.com. To charge tickets by phone, call (800) 745-3000. Mannheim Steamroller will present the best the holiday has to offer this season. The group will perform live only in Detroit at the Fox Theatre on Sunday, December 16 at 7:30 p.m. as part of the Fox Theatre Series. Grammy® Award winner Chip Davis will direct and co-produce tour performances with MagicSpace Entertainment. 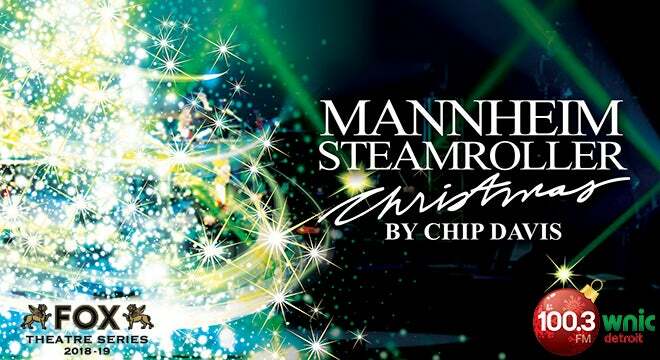 The show features Mannheim Steamroller classics, along with dazzling multimedia effects in an intimate setting. In addition to being a holiday tradition for many families, the Mannheim Steamroller Christmas Tour regularly attracts repeat attendance from multi-generational guests and is one of the longest running tours in the music industry. PBS stations nationwide will be broadcasting Mannheim Steamroller 30/40 Live this year. The milestone special was filmed to mark the group’s 30-year anniversary of musical holiday magic and 40 years of groundbreaking Fresh Aire compositions. This year’s tour includes many of the performances in the PBS special broadcast. With 19 gold, eight multi-platinum and four platinum-certified records, Chip Davis is among an elite group of artists that include U2, Jay-Z and The Beach Boys with such certifications.